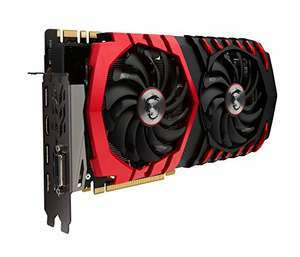 Another 1080 Geforce card, this time it's MSI. Good spot on Novatech. According to the Nvidia site you should get the game from Amazon too, the redemption is made from the Nvidia redemption page for those that have used it. Amazon UK don't honour destiny 2 free game. It's only Amazon USA. Wait for 1080ti deal. I'm doing the same, hopefully I'll be able to get a good price for 2 of my 980ti's so I can upgrade for not much more. My two cents but this is still too expensive. The gain is minimum compared to how much more you pay for this instead of a 1070ti. I'm waiting for a deal on the 1080ti so I can get consistent 240fps at 1080p minimum. Wait for 1080ti deal. I'm doing the same, hopefully I'll be able to get a …Wait for 1080ti deal. I'm doing the same, hopefully I'll be able to get a good price for 2 of my 980ti's so I can upgrade for not much more. Bought a GTX 1070 over black friday, regret it now. Didnt need a new gpu! Yeah I try to, I build my rig to play GTA V at 4k. I think 1 of these bad boys will be enough however, you could wait until the ti is reduced. I don't know if Nvidia have anything in the pipeline though. My two cents but this is still too expensive. The gain is minimum compared …My two cents but this is still too expensive. The gain is minimum compared to how much more you pay for this instead of a 1070ti. This isn't really that much more than a 1070ti, it's also factory OC and has 11Gbps GDDR5X RAM, most 1080's have 10Gbps. 1070ti's have less cores and GDDR5 non X.
Yeah I try to, I build my rig to play GTA V at 4k. I think 1 of these bad …Yeah I try to, I build my rig to play GTA V at 4k. I think 1 of these bad boys will be enough however, you could wait until the ti is reduced. I don't know if Nvidia have anything in the pipeline though. Technology moves so quickly it's not long until they're out of date, it's annoying! If I was you I'd just put keyword alerts on here (if you don't already) and just pick one up when you see a good deal. Technology moves so quickly it's not long until they're out of date, it's …Technology moves so quickly it's not long until they're out of date, it's annoying! If I was you I'd just put keyword alerts on here (if you don't already) and just pick one up when you see a good deal. This isn't really that much more than a 1070ti, it's also factory OC and …This isn't really that much more than a 1070ti, it's also factory OC and has 11Gbps GDDR5X RAM, most 1080's have 10Gbps.1070ti's have less cores and GDDR5 non X.
GDDR5X is actually not really better but worse in some cases. (Memory heavy algos) 16% more expensive for 5% more cores. Get this numbers in line and I would definitely vote hot. The more you look at what else is on offer and what longevity you will get from this card, the more you realise you should just buy this. Keep watching and waiting, you got less than a month of 2017 left then in 2018 Volta will be here at some point, and for the time left if you have not already jumped onto a 10-- series card then you might as well wait that little bit longer and see what happens. I've ordered it. Was planning to wait for the next gen of Nvidia cards but then I started being concerned about noise (my 970 is very loud) and this card is generally considered the quietest around. Likely to be 6-12 months before aftermarket cards are available and I don't want to wait that long, especially as we don't know what price they'll be at or how much of an improvement they'll be. I own the older MSI 1080 gaming X. Bought it for £400 9 months ago. At this price, I'd wait for 1080ti bargain. Or if you can't wait, look at the 1070ti for similar performance but more value for money. Just purchased a 1070 for £410. Not sure if i should send it back and get this. I also ordered from Novatech on 3rd december, no voucher codes were in the box, just the receipt for the card. Very dissapointed because if you got on their site now it actually shows that you get a voucher too, but I've just assumed I would back when I ordered. Not sure how to claim from Nvidia directly, they need a coupon code.